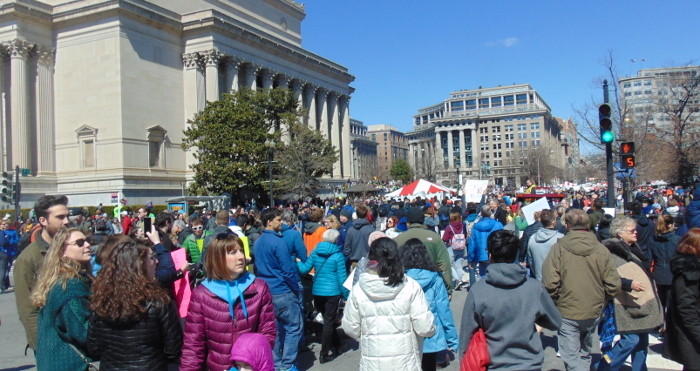 Technically, it was called "March For Our Lives," but we had way too many people in attendance to even try to move a large block of them. Sunny day in Washington DC, but I was happy I had a large, heavy coat on. Never once wanted to have worn something lighter. 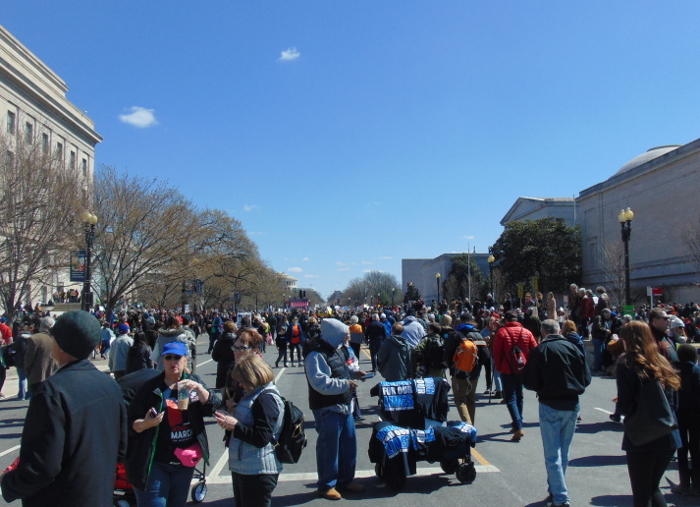 I saw estimates late that day that placed the crowd size at a million, but most news organizations have settled on a high-end estimate of 800,000. So what exactly is the problem with guns that the teenagers that survived the shooting at the Marjory Stoneman Douglas High School are concerned about? 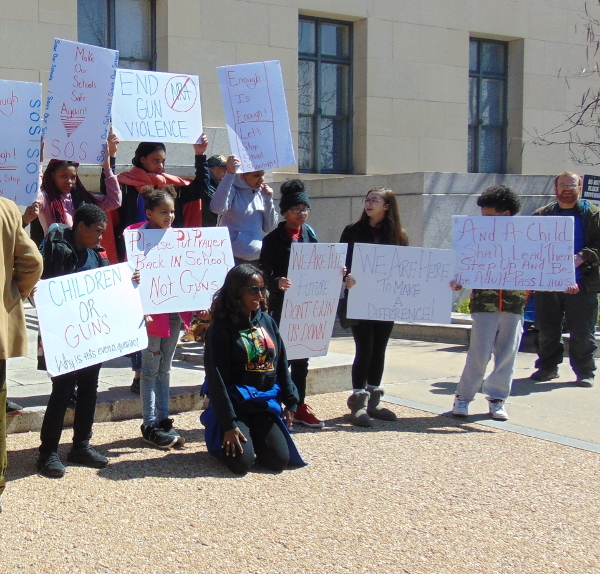 I wrote two extensive blog posts on guns in February and March. I wrote to our local paper with a thesis, that there are four basic purposes for non-law enforcement civilians to possess firearms. 1. Self-defense 2. Hunting 3. Entertainment and 4. Defense against tyranny. The first three purposes can be addressed without one's gun having more than ten rounds in it. If one needs another ten rounds, one can keep extra magazines on one and change them out when they're empty. It was my last assertion that other commenters focussed on, that we don't really need guns to fight tyranny with. The usual talking point that Representative Steve King (R-IA) repeated against 18-year old Parkland student Emma Gonzalez was that the Castro regime confiscated people's guns and then the Cuban people were helpless to resist the tyranny that Castro then imposed. The fact-checkers at the WaPo responded that King's history was lacking, Cuban citizens actually own guns in large numbers as they have citizen militias. A popular idea going around is that many peoples that suffered oppression and genocide did so because they were unarmed. That the Jews and Ukrainian peasants of Nazi Germany and the Soviet Union simply needed guns and then they would have survived. Kind of a problem with that is that the loss of rights tends to precede the loss of guns. It's not that people first get their guns confiscated, then they lose their liberty, but the other way around. But more to the point, a piece in The Atlantic examines the idea that America won its war of independence because we had an armed population. The problem with this idea was that the colonial militia in America was far more highly disciplined, equipped and organized than popular interpretations of history suggest. So how did our President respond to the rally on Saturday? Essentially, his actions suggested that he doesn't represent the American people, but instead represents a faction of the Republican Party. The entirely accurate phrase that was used as a jeer against Trump was "Our children are dying! Trump is golfing!" Trump went off to one of his golf resorts on the day the rally took place. He still had nothing to say about the rally over 24 hours later. Very sadly, "After [President Trump] golfed, his motorcade took a detour to avoid protesters on the way back to his Mar-a-Lago estate." 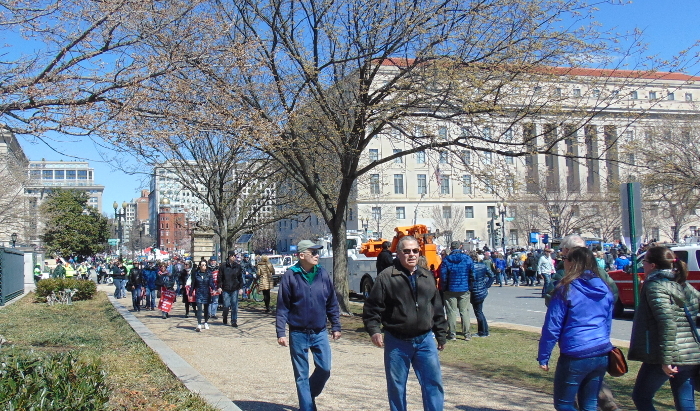 It was too much trouble for him to even see the signs of the demonstrators who were in favor of gun safety. Because if it is about keeping our schools safe, then we have to have a much broader discussion than the discussion that's going on right now. How about kids, instead of looking to someone else to solve their problem, do something about maybe taking CPR classes or trying to deal with situations that, when there is violent shooter, that you can actually respond to that. Here's the Jumbotron or big TV screen that we could see from where we were. The NRA has its own private, 24-hour a day TV channel where they told America what they think of the students who organized the nationwide rallies and of those who attended those rallies. 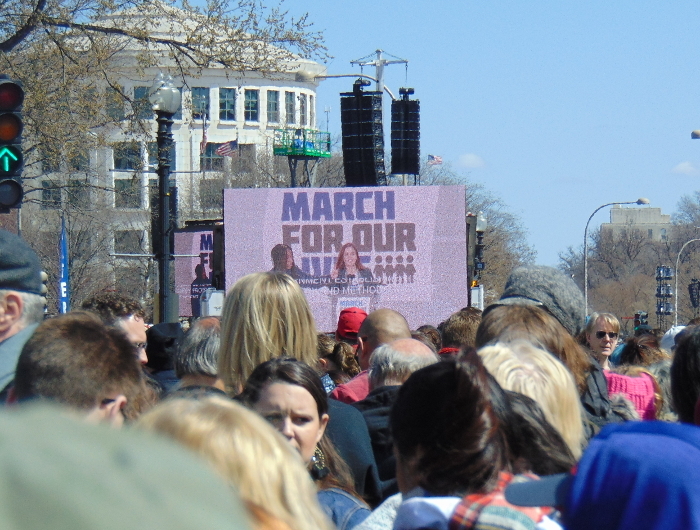 In between segments about trick shooters, something like a gun-focused Antique Roadshow, and advertisements for NRA products, NRATV was brimming with disdain for the March for Our Lives Thursday, as hosts of talk show-style shows argued that the march was really a front for socialist efforts to destroy the constitution and claimed that the march organizers were violent, anti-American, and pro-cop killing. They see the Women's Marches of 2017 and 2018 as well as the Black Lives Matter movement as both being tools of the liberal left. 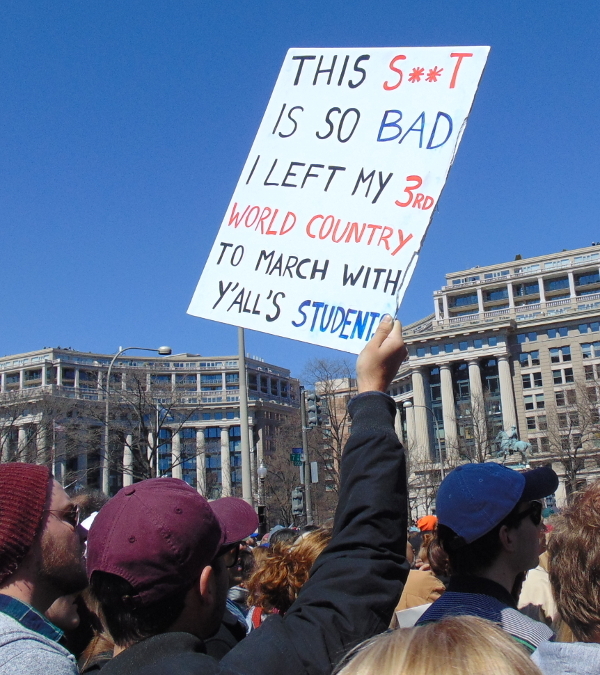 So anyway, the really good news from the rally is that, in public opinion polls, the pro-gun safety students are absolutely stomping the NRA and their supporters. The positive/negative rating for the students is 56/34 with 60/32 for stronger gun laws in general and 87% public support for background checks on all gun buyers.